For some staff this can be worth thousands of dollars per year. Many other financial institutions used to have similar packages but most were ‘bought out’ during employment negotiations in the 1990s. So, ANZ’s package is somewhat of an anomaly. Now however, ANZ is trying to retire the old package and replace it with it’s new one. The new package offers 0.5% off the variable home loan rate and not much else. If any staff on the old package make changes to their existing benefits – such as redrawing on their home loan – they will be switched to the new package and the worse interest rate. Finsec has written to the bank about this and is awaiting a response. But because the benefits package is not written into ANZ National’s collective agreement there is little that Finsec members can do individually to reverse this decision. Great use of my photograph. 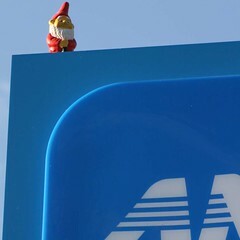 That little gnome will love the international coverage! Thanks for sharing the photo with us. Now then! Very useful advice in this particular post! Now then, its question time, do I have the opportunity to ask anything? It’s not my aim to be a ballbreaker, but I think you can do better content than this. More content would be good. For some reason I almost had a female moment at a dog that died near the end of futurama. I am confident they willl be benefited from this site. I love reading article and i visit many website for reading different blogs.After reading your blog i found desirable result.Thanks for your posting it here.Feel free to update us form such type of stuff.